Ariocarpus fissuratus, harsh habitat at Nine Point Draw. 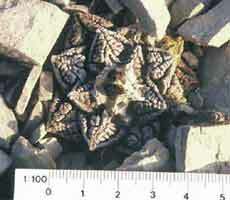 Ariocarpus fissuratus, a large plant of the population af Nine Point Draw. Ariocarpus fissuratus, plants here have a hard existence. 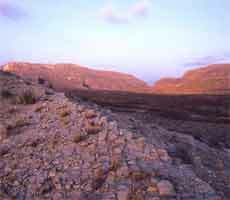 A population of very small A. fissuratus plants growing on a series of low hills composed of Boquillas limestone. 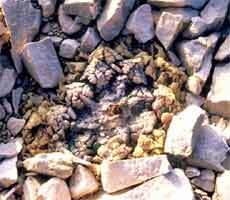 Most plants grow embedded between limestone plate edges where those are exposed to the surface. Tiny plants, 3-4cm in diameter flowering at a very small size 2.6-2.8 cm.